At Leckner Chrysler Dodge Jeep Ram, we're excited to discuss all of the safety features found within the Dodge Journey. An array of technologies and equipment will keep you and your family safe on the roads of King George. From airbags to an advanced brake system to a rear back up camera, the Journey has it all. Some of the most important features include the backup camera as well as the rear park assist system. There are also seven advanced airbags combined with a protective frame in the event that you are in a collision. Front and rear crumple zones are also there to help absorb impact energy so that it is redirected from passengers. 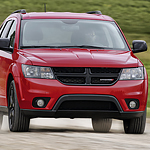 Of course, the Dodge Journey has also included a significant amount of advanced technologies. This includes brake assist with emergency braking, antilock brakes, electronic stability control, and even electronic roll mitigation so that you’re in greater control behind the wheel.